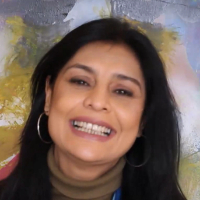 Nikki Anand is an Indian Origin Arch of Excellence awarded fine artist and philanthropist. Now popularly known as the Divine Artist her pictorial language is basically symbolic, vibrates with spontaneity and purity. Figures, abstracts, landscapes, or impression of the creations of the Universe, her paintings shimmer with magical, spiritual Power. Her unique merging of colors, even when diffused, read as a mass of interrelated detail. The intuitive, rhythmic flow of her brush allows intimations of universal energy to manifest on the canvases. Influenced by, and in tune with, cosmic vibrations and energies universal in nature, images reverberate in the human soul. With numerous solo and group shows and commissioned works to her credit, she has traveled the globe with her exhibitions. Her works are in patron collections in various countries, including the USA, Australia, Canada, United Kingdom and others. Art is usually about self-expression because the artist feels strongly enough about what they are doing to try and put it into a form that they, and others, can come to terms with. "After completing my Graduation in Fine Arts, I started painting. I am a fully fledged artist holding art exhibitions worldwide. I also take art workshops and work on commissioned projects."